What’s the best way to sort your laundry? Why is Facebook so good at predicting what you like? Readers around the world have embraced Ali Almossawi’s whimsical illustrations and his funny, clarifying explanations of complex subjects. In Bad Choices Almossawi demystifies a new topic of increasing relevance to our lives: algorithms. This is a book for anyone who’s looked at a given task and wondered if there was a better, faster way to get it done. What’s the best way to organize a grocery list? What’s the secret to being more productive at work? How can we better express ourselves in 140-characters? Presenting us with alternative methods for tackling each scenario, Almossawi guides us to better choices that borrow from same systems that underline a computer word processor, a Google search engine, or a Facebook ad. Once you recognise what makes a method faster and more efficient, you’ll become a more nimble, creative problem-solver, ready to face new challenges. Bad Choices by Ali Almossawi is a very clever, educational book designed to help explain IT concepts to budding programmers. It is a conceptual book, explaining what can appear to be quite complex ideas, using everyday examples. Not only does this book explain ideas around algorithms, but when reading the book, it makes you realise how you already follow many of the examples in your everyday life. Almossawi shows how mundane tasks such as sorting socks into pairs can be a descriptive way of looking at ‘arrays’ in computing. You learn how to escape a maze in the most efficient way and how to sort numbers in a ‘linearithmic’ way. I had started a new programming project which required me to write complex XML graphs. I hadn’t even heard of XML graphs at this stage and found the concept quite challenging. It was only once I had learnt how to write graphs that I came across this book. XML graphs are described in a wonderfully simplistic way using the example of a beaded necklace with someone’s name on the beads. I wish I had read this book before starting the project as my life would have been made so much easier. The book seems to be aimed at would-be programmers, students, and people who want a different logical way of looking at things. It is easy to read and most importantly, easy to understand. The concepts discussed are very relevant to computer programming and I would recommend this book to anyone looking to get started in this field. Ali Almossawi is the creator and maintainer of An Illustrated Book of Bad Arguments, which has been read by 2.6 million readers and translated into 18 languages, 12 of which were done by volunteers from across the world. 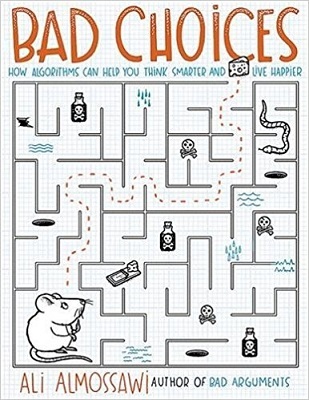 His second book, Bad Choices, is an illustrated guide to algorithmic thinking. Ali currently works as a data visualizer at Apple and was formerly a data visualization engineer on the Firefox team at Mozilla, a research associate at Harvard, and a collaborator with the MIT Media Lab. He is an alumnus of MIT’s System Design and Management program and Carnegie Mellon’s School of Computer Science.